Edouard Chautard and Carine Thomas rode through the Jungles of New Caledonia! Click on picture to enlarge The jungle environment of New Caledonia, a seldom-visited island in the South Pacific, is so hostile that Equestrian Explorer Edouard Chautard is seen packing feed and supplies on his record-breaking ride. Edouard and Carine set off on 1st September to ride around the perimeter of New Caledonia, approximately nine hundred miles. 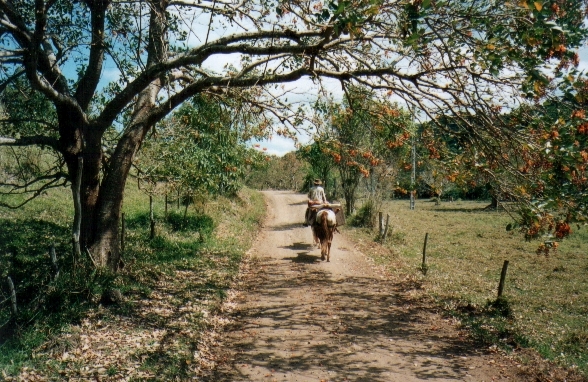 Though the island is inhabited by French-speaking natives, because of its close proximity to Australia, the horsemen of New Caledonia have been strongly influenced by that neighbor's equestrian traditions, including the use of the Australian Bush Saddle. This is not the first time that Edouard Chautard has attempted the impossible! He has made several other short expeditions into the interior of New Caledonia, which is riddled with poisonous plants and abandoned nickel mines, all of which are potentially fatal hazards for the horses. Edouard was riding Prisca, an 11-year-old paint horse. Carine will be on Jet Ebony, a 4-year-old Quarter Horse, while Colorado, a 7-year-old Appaloosa, carries the packs. Before leaving on their expedition, Edouard emailed The Long Riders' Guild to say, "I am so glad to go on such an exploration. I don't know if it is really possible or not but I hope everything will be OK. This time we are not going to try it. We are going to do it!" In November 2001 The Long Riders' Guild received an email from Edouard. "We went more than 1050 kilometers. We stopped our travel at Houailou because our horses got back problems (too much moisture, the horses' hair went down). We didn't want to continue to ride them because we absolutely didn't want them to get hurt. - we rode for more than a thousand kilometers. Before ending his email to The Long Riders' Guild, Edouard sent a very personal message to CuChullaine which we think we should share with you. "On September 11th, I was far away from everything, I thought. I was just on the way to a small village to re-shoe one of my horses. Nothing in the world could bother me, I thought. But arriving back in civilisation I got caught again by "the news." At this moment, all my thinking went to you, and how you must feel. I just thought that it must be terrible for you to see what was going to happen to that country far away, Afghanistan, that you probably still love, and what happened to the other country you were living in at the moment. I felt so sorry. Then, I realised that on a horse trip, you don't go far away from everything but you perceive things in a new way. You can't go backwards. So the only way is to go on the trail again and again... Regards, Edouard."